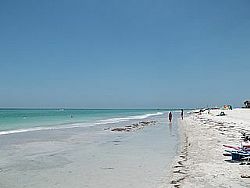 LONGBOAT KEY – The Florida Department of Environmental Protection has awarded $500,000 in grant funding for a beach stabilization project that also provides recreational opportunities at the North Shore Public Beach Access to residents and visitors of the town of Longboat Key. As a part of the Beach Management Funding Assistance Program, DEP reimbursed Longboat Key for a portion of the renourishment project, which was completed in June. Approximately 13,000 tons of compatible beach sand was brought in to renourish the degrading area, and provide critical nesting habitat for sea turtles. The project also included construction of two permeable adjustable groins, which are structures built to protect the beach from coastal erosion. Since the project’s completion, two turtle nests have been spotted and marked for protection. Previously, the beach was subject to frequent breaching during storms that threatened the critical habitat for nesting sea turtles. Florida's beach and dune system acts as the first line of defense during hurricane season. Beach renourishment reduces the impacts of storm surge and provides wave attenuation, reducing potential for structural damage. Since 1999, Florida has invested almost $659 million to restore and maintain more than 227 miles of Florida beaches.